Saint among savages. The life of Saint Isaac Jogues, by Francis Talbot S. J.
I just finished the most amazing story: it is definitively not politically correct, it is very gruesome at times with long descriptions of tortures and cruel torments, but (and that is what kept me reading) I found it a most inspiring story on the importance of offering the faith in Jesus-Christ and spreading the Gospels. Saint among savages, the life of Saint Isaac Jogues, by Francis Talbot S. J. is the account of how the first Jesuits arrived on this North American soil and what they went through to evangelize native Indians. It is specifically the story of Saint Isaac Jogues, his love of God and his martyrdom in 1646, in Canada. 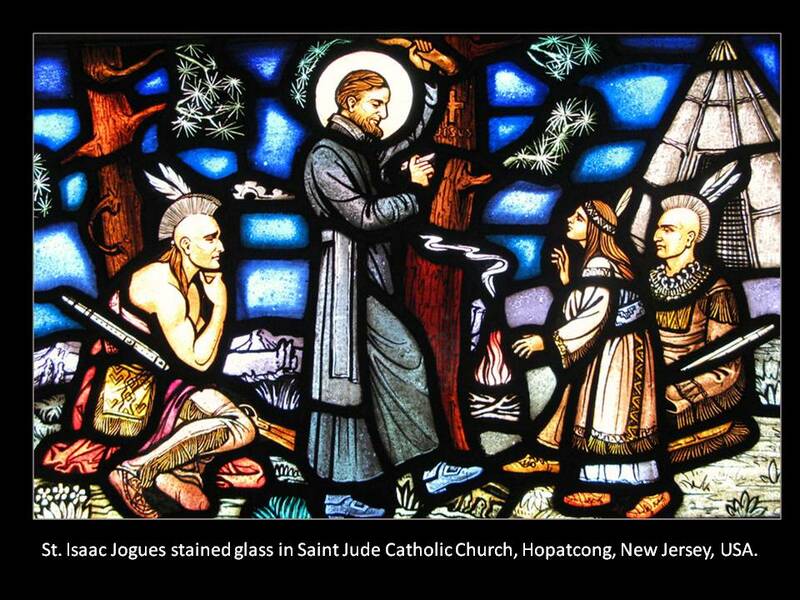 A Saint Among Savages: tortured by Huron and Iroquois, Saint Isaac Jogues died in 1646. He offered the sacrifice of his life to bring the faith to North America. I find the following pages from the book on the life of Isaac of Jogues very haunting: they show God's work in our souls, opening our minds and softening our hearts. From this village arose the most outstanding convert of the year. Ahatsistari was honored as the greatest war chief of all the Huron nations. So amazing were his deeds that he had already become a hero of legend. "This man's life is but a series of battles", the missioners asserted. In the past summer, Ahatsistari with fifty Huron braves attacked three hundred Iroquois and brought back a large number of scalps and prisoners. A short time later, scouting about Lake Ontario, he was surprised by a strong Iroquois war band. His few followers, terrified, were for darting off in flight. "No, no, comrades, Ahatsistari shouted. "Follow me. We'll start the attack". He drove his canoe headlong into the Iroquois fleet. Alone, he leaped into the foremost enemy canoe. He split the skulls of the two Iroquois nearest him, hurled two others into the water, leaped after them, and upset the boat. Swimming with one hand, he wielded his tomahawk with the other and smashed the heads of the floundering enemies. Hurons and Iroquois watched the single handed battle as if entranced. Then, Ahatsistari, shrilling the war whoop, stroked out against the other Iroquois canoes. Demoralized, they fled. [Since 1638, Ahatsistari had listened to the Jesuits. He was keenly interested in their doctrines but he refused first to abandon his tribal ceremonies. But later he asked for baptism, and in 1642] Father Jogues and the other missioners held council, in the Huron fashion, and each of the natives who sought baptism was called upon to argue his petition. Ahatsistari addressed them thus: "I have the Faith deep down in my heart, and my actions during the past winter have proved it sufficiently. In two days, I am departing on the warpath. If I am killed, tell me: where will my soul go if you refuse me baptism? If you saw into my heart as clearly as the great Master of our lives, I would already be numbered among the Christians, and the fear of the flames of hell wound not accompany me, now that I am about to face death. I cannot baptize myself. All that I can do is to declare with utmost honesty the desire that I have for it. After I do that, if my soul be burned in hell, you will bear the guilt of it. Whatever you may decide to do, however, I will always pray to God, since I know Him. Perhaps he will have mercy on me, for you say that He is wiser than you are." "What made you first think of believing in God?" one of the Fathers questioned him. "Even before you came into this country", Ahatsistari responded, "I had escaped from a great many perils in which my comrades were killed. I saw very clearly that it was not I who saved myself from these dangers. I had the thought that some spirit, most powerful and unknown to me, was favorable to me and aided me. We peoples attribute all of our good fortune to dreams. But I was convinced that all that was only nonsense. Still, I did not know much about it. When I heard of the greatness of the God whom you preach, and of what Jesus Christ had done when he was on earth, I recognized Him as the being who had preserved me. I was resolved to honor Him all my life. When I went to war, I recommended myself to Him night and morning. It is to Him that all my victories are due. He it is in whom I believe. I ask for baptism, so that He may have pity on me after my death." Ahatsistari was solemnly baptized in the chapel of Sainte Marie on March 30 and was given the name Eustace. Excerpt from Chapter VI "Driving ever Westward" from Saint among savages, the life of Saint Isaac Jogues, by Francis Talbot S. J.
Saint Isaac, pray for us! Saint Kateri, pray for us!